Have a sexual abstinence of 3 – 4 days. More than this is not advisable (no less than 2 days and no more than 7). If you obtain the sample at home, the period of time between the sperm sample collection and the delivery of it in the laboratory should be shorter than 1 hour and a half. Collect the sperm sample in a sterile container, which you can buy in a pharmacy. The collection of the sperm sample must be performed under hygienic conditions. Once the sample has been obtained, be sure that you’ve closed properly the container and that the sample doesn’t get too cold. We recommend carrying the sample in an interior pocket. If the delivery of the sample is not done in less than 1 hour and a half, it is advisable to obtain it in our clinic. 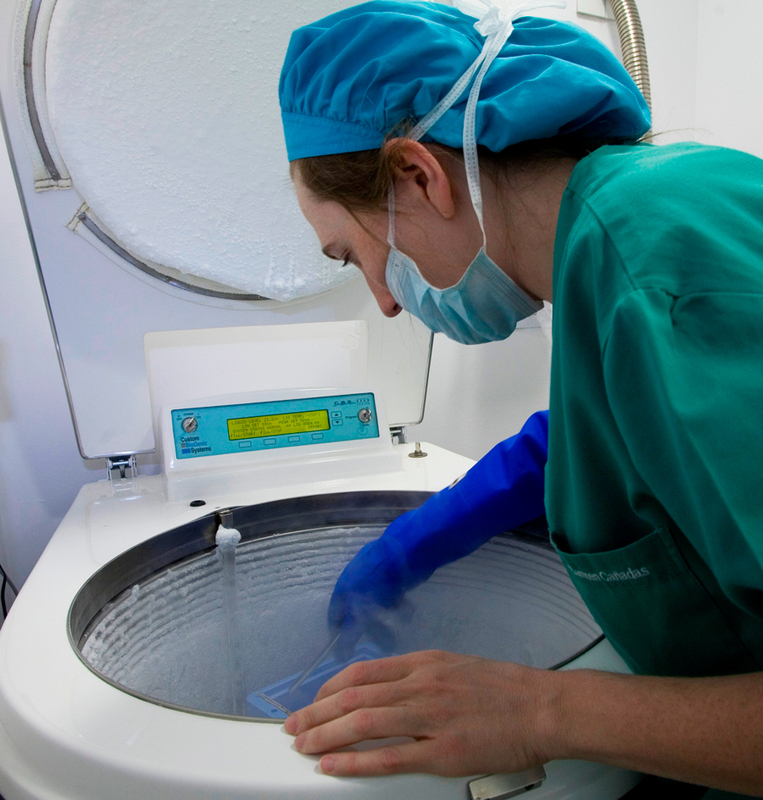 Sperm analysis: Our andrology laboratory will analyse the sperm sample and will decide if it can be cryopreserved. Sperm freezing: Once the biologists decide that the sperm sample can be cryopreserved, the sample is mixed with a cryoprotective medium and frozen by using liquid nitrogen (-196º). Afterwards, it is kept in our sperm bank until the patient requires it. Sperm could be cryopreserved in liquid nitrogen for an unlimited period of time. To make this possible, the sperm is protected by using a cryoprotective medium that conserves it. We have achieved pregnancies by using sperm samples which were frozen even 15 years ago. In which cases is sperm cryopreservation recommended? Patients who are going to undergo a treatment that may affect its reproductive system, such as chemotherapy, or even before doing a vasectomy. Patients undergoing an IVF cycle (even if a fresh sperm sample is going to be used), since having frozen sperm helps to avoid unexpected situations and makes the couple feel more relaxed. Sometimes it is not easy to obtain a sperm sample on the day when fertilization takes place. Patients who are experiencing a deterioration of sperm quality, due to known or unknown causes. Patients who have a very low sperm count and for who it has been advised to freeze several samples in order to accumulate sperm.